A pub near Hampstead Heath Station, refurbished recently (September 2008). 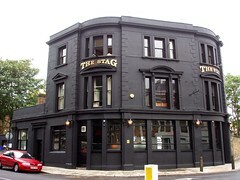 Outside, it's dark paint with the name of the pub standing out in punchy letters. Inside, the bare wood floors and wooden tables suggest a certain style of refurbishment. However, it's really quite nice, and aside from the area around the bar, there's a large and impressive beer garden with plenty of covered seating. Service is friendly. There are two handpulls with Landlord and Flowers IPA on a visit in October 2008. There's also a very good wine list, with a large glass of red wine at around £5.50 getting a particularly positive review from Jo. A menu was on display, covering all the usual options photo, including an excellent cheese list photo, though unfortunately Ewan didn't get a chance to try anything on this visit except for the olives (very good, with plenty of cracked pepper). However, I'll definitely return to try the food. Accessibility: A rather surprising step down to get into the pub, but after that, everything's on the same level. Last visited by Ewan and Jo, 5 October 2008. Last edited 2013-05-10 08:06:01 (version 7; diff). List all versions. Page last edited 2013-05-10 08:06:01 (version 7).